Taking Your Wedding Social: Do's and Don't's! Taking Your Wedding Social: Do’s and Don’t’s! “I do!” Do you really? We’re talking about taking your wedding social, of course! There are many positives to sharing your wedded bliss all over social media (after all, that’s how most of your friends discovered your engagement), but there are tricks to it. You wouldn’t mind some of your wedding photos going viral, right? But what if they go viral for all the wrong reasons? Yes, it’s time to take a pause before you go social and morph into Bridezilla all over the Internet. In fact, there are important do’s and don’t’s that you need to take into consideration before you put one pic, post, video, or tweet up for the world to see. Do you want everybody in on your social wedding? Yes, you do! Whether you’re making your wedding completely social or social adjacent, it’s polite to let all those attending in on your plans. Set some parameters and tell them what you’re okay with sharing on Facebook, Instagram, Twitter, Snapchat or the like. If you think your vows are too sacred to be posted, let them know. If you do want pics and posts of you sashaying down the aisle in your Vera Wang, let them know. Above all, your guests should know that there’s a real wedding going on and not just a big social media circus, so gently remind them not to forget to watch the wedding instead of their screens. Do you want a hashtag to be integrated into your wedding? Of course you do! Create a hashtag that will be used for your special day. This will be unique to your wedding and pique everyone’s interest, plus make it easy for guests to swap and share pictures. Word of advice: make sure that your guests know this hashtag ahead of time to avoid any confusion. You can include it on the announcements or invitations, and you might even want to use it while you are planning the wedding to help yourself stay organized as you take pictures of venues or flowers or cakes. Just remember not to use it for the dress! Do you want to take some selfies? Yes! 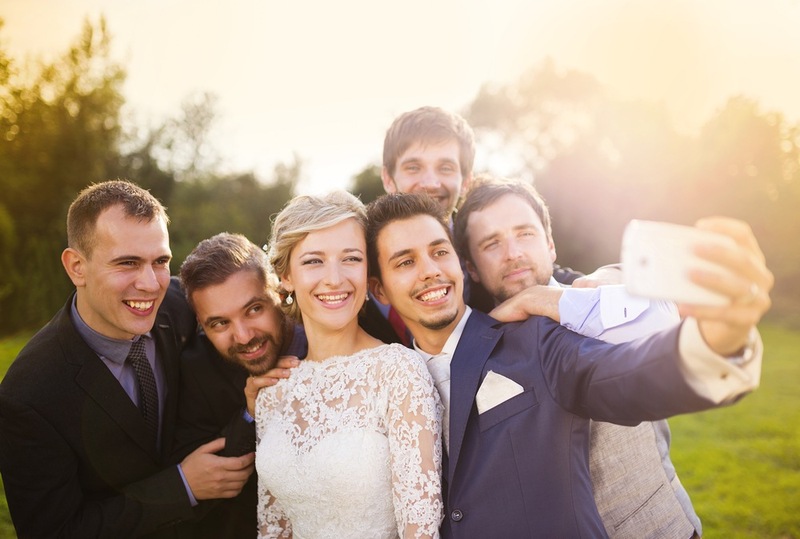 More than anything, a wedding is about you and your spouse, so it behooves you to snap as many selfies on your wondrous day as possible. Don’t feel bashful; go ahead and take those selfies and share with the world exactly how happy you are. But don’t forget to include your spouse in the pic since he or she is kind of important to your wedding, too. Do you want to be on social media all day? This is a definite don’t. Even though your wedding is steeped in social media that doesn’t mean that you should be. This is your wedding day – once in a lifetime! Yes, as part of making your wedding social, you do have some obligation to post pics, tweets, messages and all that great stuff, but that shouldn’t be where your mind is. Before the wedding, definitely post some moments that you and your spouse will cherish long afterward. During the reception is a great time to go around and get pictures with all of your guests, as well as see what they’ve captured throughout the day. As long as your guests are also participating and making use of your hashtag, you know you’re going to get lots of amazing pictures and moments without needing to do it all yourself. Do you want to give away special moments or surprises ahead of time on social media? No, you should try to keep anything special under wraps. That’s part of what makes a wedding so magical – the element of surprise. Maybe you and your spouse have these killer vows you’re all set to say with a 12-piece orchestra playing softly in the background. You shouldn’t post ahead of time letting people know this is going to happen. Even in our digital age, the element of surprise should be well represented and respected, especially in a wedding. No spoilers, please. Plus, if you want a truly memorable social moment, you want genuine reactions from your guests. Do you want to get rid of the professional photographer? Never. Weddings and photographers go together like chicken and waffles; they make the experience a whole lot better together. There’s something to be said about a professional. A pro photographer will know the right lighting, angles, composition, backdrop and most importantly, he or she will intuitively know which moments to capture. If you rely solely on your wedding guests—your maybe-less-than-sober guests—you might end up with pictures that don’t really capture the true essence of your day. And you’ll miss out on the beautiful portraits and detail pictures that professionals are so adept at taking. After all is said and done, taking your wedding social is not only a great way to have lasting moments that you can look back on in the future, but it’s a way to share your big day with family and friends that weren’t able to attend. Just remember to take our tips into consideration for a successful social wedding and it will be a piece of cake.